The new president of the European Parliament (EP) has been elected yet on the very first round of voting, because he at once gathered an absolute majority. 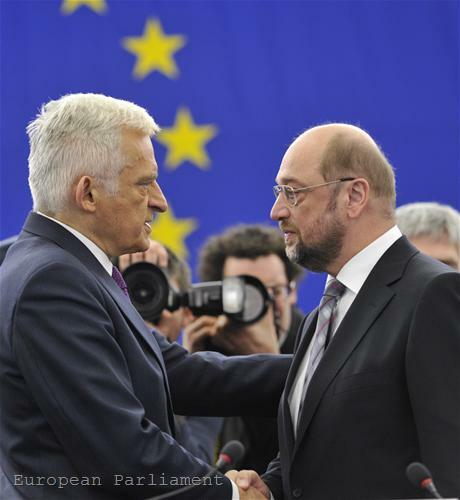 The first representative of Eastern Europe Jerzy Buzek has been replaced by German socialist Martin Schulz, who led the parliamentary group of the Progressive Alliance of Socialists and Democrats (PASD) before that. 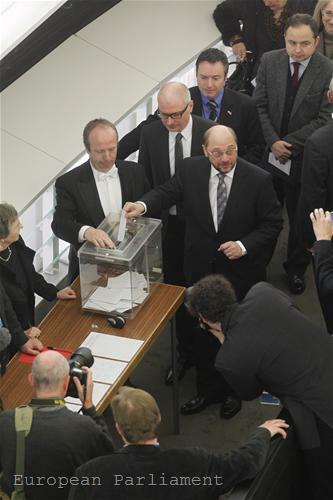 Out of 670 valid votes Mr Schulz was elected by 387 of the votes as the needed majority was 336. The other two candidates - British liberal Diana Wallis and her country fellow from the group of European Conservatives and Reformists (ECR) Nirj Deva, ended with almost equal outcome, respectively 141 and 142 votes. The new president of Parliament is born on 20 December 1955 in a small German town near the border with the Netherlands and Belgium. Right after school he starts work as an apprentice in a bookstore and later opens a shop of his own in 1982, which he managed for 12 years. This is why he is known among his colleagues with the nickname the "bookseller". He starts his political carrier early - at the age of 19 when he joins the German Social Democratic Party (SDP). At the age of 31 he becomes the youngest mayor of the small town of Wuerselen in the most populated German province of North Rhine-Westphalia. He held the post for 11 years. In his own words it is this time when his enthusiasm for Europe has been formed, as well as his conviction that he wanted to construct the European project, which will become clear from his opening speech below. He is elected for the first time to the European Parliament in 1994. He is one of the most active members of the European Parliament (MEP) and as a leader of the PASD group he is among the most frequent speakers in many of the important debates, related to the European debt crisis and the search of a solution. Not accidentally this is the focus in his first speech, delivered right after his election. 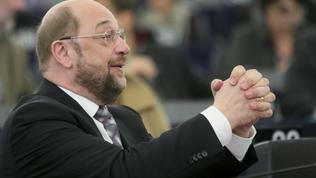 In fact, although he criticises the backroom deals that the member states make in the course of looking for a solution to the eurozone debt crisis, Martin Schulz is accused that his election was pre-decided and is a result of a backroom deal between the socialists and the European People's Party (EPP). 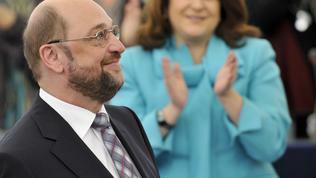 It is a fact that Schulz looked confident during the voting and had prepared his speech in advance. I take this post with humility! 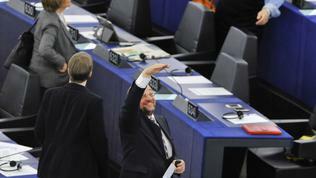 With these first words Martin Schulz turned to his colleagues from the president's position. The main reason is that in today's turbulent times people cannot be certain any more that their children will be better off, as was the credo of Schulz's parents' generation. "And we are better off! However, we can no longer be sure that the same will be true of our own children. 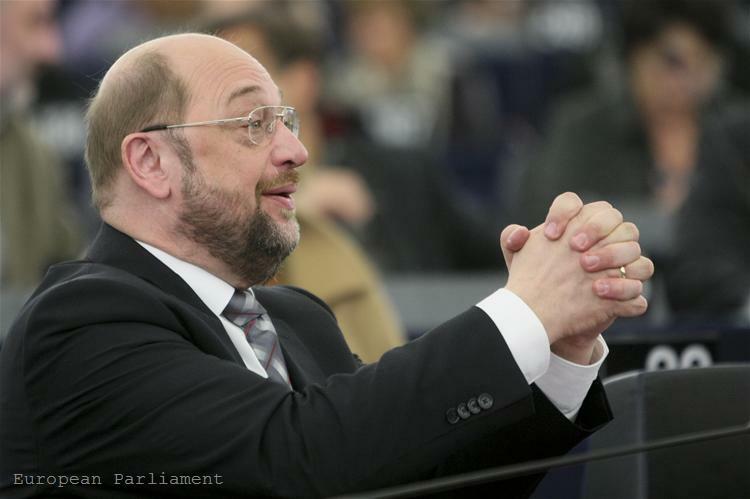 As a result of the economic crisis, in many countries poverty is on the increase and unemployment has reached disastrous levels among young people in particular", Schulz said in the typical left lexis. "They [the young people] are now taking to Europe’s streets to protest against an economic system which allows a small minority to rake in the profits when times are good, and forces society as a whole to bear the losses when times are bad; a system whose workings might lead a dispassionate observer to conclude that anonymous ratings agencies in New York are more powerful than democratically elected governments and parliaments". 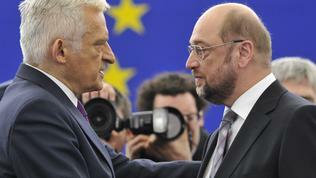 Moreover, continued Schulz, times have come in which the European Union's failure is quite a realistic possibility. "For months now the Union has been stumbling from one crisis summit to another. Decisions which affect us all are being taken by heads of government behind closed doors. To my mind, this is a reversion to a form of European politics which I thought had been consigned to the history books: it is reminiscent of the era of the Congress of Vienna* in the 19th century, when Europe’s leaders were ruthless in their defence of national interests and democratic scrutiny was simply unheard of", Mr Schulz said with the usual fervour of his powerful emotionality. "The representatives of the peoples of Europe have essentially been reduced to the role of rubberstamping agreements reached between governments in backrooms in Brussels", he concluded. And he challenged anyone who claims that "more Europe can be achieved with less parliamentarianism". The first test, according to him, would be the fiscal pact, which the EP criticised a number of times because it set division within the European Union. Compared to the modest and dialogue-preferring predecessor of his, Jerzy Buzek, Martin Schulz is much more aggressive, uncompromising and pushing. 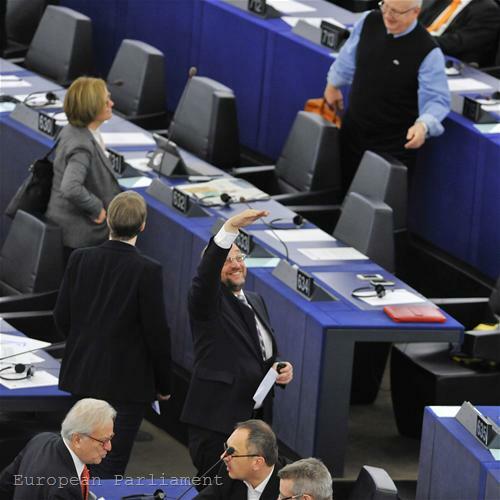 This feeling is probably shared by his colleagues, as British MEP from the Alliance of Liberals and Democrats for Europe (ALDE) Andre Duff wrote on Twitter on January 17: "Good opening speech by new #europarl president #Schulz. But he'll be a different kettle of fish to gentlemanly #Buzek. Good luck". And on December 18th the British MEP wrote in his blog, who is the author of the proposal for electoral reform in the EU, proposed a change of the rules for internal elections. According to him, it would be much fairer the MEPs to be able to arrange the candidates according to their preferences, which will significantly accelerate the election of a Bureau, the so called preferential list. The election of a chief of parliament, deputies and members of the Bureau took the institution 3 days. The new EP's president's aggressiveness and steadfastness was visible quite clearly in his speech regarding the EU candidate countries. "The European Parliament’s role must now be to ensure that the principle of democracy and basic rights and freedoms are respected and implemented as a matter of course in the Member States as well. Whoever breaches the values enshrined in our Charter of Fundamental Rights must reckon with us as adversaries". The tough nature of the German EP president emerged quite clearly in 2003 when Martin Schulz angered the then Italian PM, Silvio Berlusconi, whose country had just taken the EU presidency. Regarding Schulz's constant criticism against Italian PM's domestic policy, Mr Berlusconi turned to the German MEP and said: "Mister Schulz, I know of a movie-producer in Italy who is making a film about Nazi concentration-camps. I will recommend you for the part of a Kapo (concentration-camp inmate appointed as supervisor). You are perfect!" The upcoming months will show to what extent this temper of the new president of Parliament will be fit to defend the institution's main priority - to protect the spirit of the European project - the community approach. *The word is about the 1815 congress, when the four big European powers gather in Vienna after the defeat of Napoleon to try and create a balance of powers, aimed at preventing imperialism in Europe, similar to that which Napoleon tried to impose. Differences between Prussia and Russia, however, were close to leading to new hostilities. 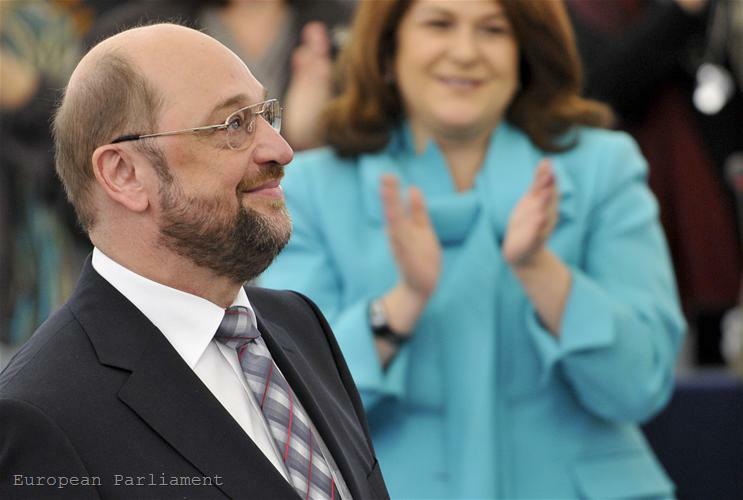 "Martin Schulz Challenges Anyone Who Restrains Parliamentariani"
Let's hope he begins by allowing a debate on a single seat for the parliament. He has opposed such a debate at every previous opportunity.